A bookcase with shelving featuring a series of satin-finished or transparent dividers set at slightly different angles like the shadows of a sundial. The detail in the separators set at various slants gives Sundial a note of originality and arouses curiosity. To the eyes of the beholder, the dividers and the books they hold look as if they are in constant evolution. 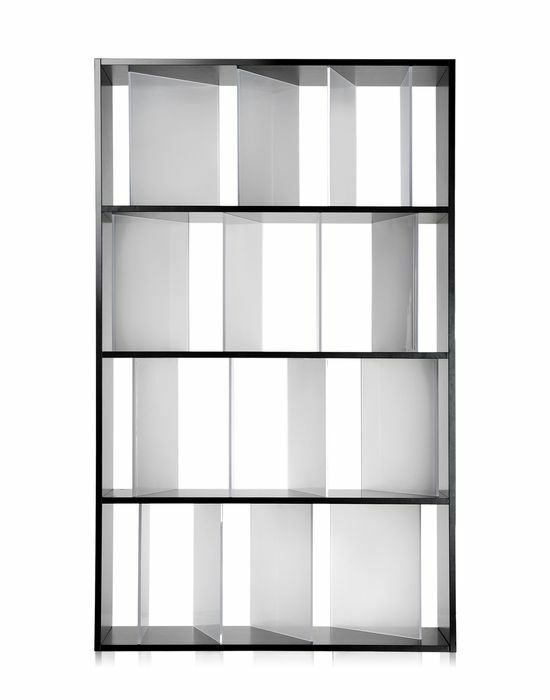 Sundial is available with a glossy white or black frame and has four shelves. This light and versatile bookcase is of moderate size so that several units can be lined up together and easily be set against a wall or used as a room divider. The injection-moulded dividers are satin-finished or transparent with contrasting glossy edges. Giving people a small ”!” moment. There are so many small ”!” moments hidden in our everyday life. But we don’t recognize them. But we believe these small ”!” moments are what make our days so interesting, so rich.